The Ragged Flagon is an inn that is part of the Thieves Guild's headquarters. The bar is run by Vekel the Man, but the bouncer, Dirge, will take over bartender duties if anything happens to Vekel. Tonilia, the first Thieves Guild fence, is also always found at the bar. It is located within Riften's old sewer network and can be accessed through the Ratway. After joining the Thieves Guild, quicker access becomes available through the headquarters's secret entrance, which opens from behind the Hall of the Dead into the Ragged Flagon - Cistern. When the secret entrance is locked later in the Thieves Guild quest line, access to the bar is still possible through the Ratway. † Syndus, Herluin Lothaire, Arnskar Ember-Master, and Vanryth Gatharian are vendors added (in that order) during Under New Management. ‡ Only appears during A Cornered Rat if left alive during Diplomatic Immunity. * Relocates to the cistern or elsewhere after related quest(s). DG Added by the Dawnguard official plug-in. Enables you to change your character's appearance. Drowned Sorrows: Find Isabelle, Ranmir's lost love. Meet the Family: Speak with some of the members of the Thieves Guild and pick up your gear. The Dainty Sload: Frame a ship's captain to get revenge for a jilted merchant. Under New Management: Become the Guildmaster of the Thieves Guild. Note: All radiant Thieves Guild quests have been omitted from the list. The first time you enter will be after navigating the Ratway. Upon entering you will be in the center of five darkened, dirty alcoves, each contains a selection of food sacks, barrels, crates and disused furniture. As you complete each of the Thieves Guild reputation quests these will be occupied by the additional merchants. In front of you is a circular shallow pool with a wooden deck opposite and the inn behind. Following the path around to the right, beyond the fifth alcove is a wooden bridge spanning the water beneath, with an inn sign hanging from a post on the right. The inn has three small tables and chairs arranged in front of the counter like any other inn. There are cupboards, barrels, sacks and crates all around the room, as well as the counter in front of the east wall. The innkeeper, Vekel the Man is found standing behind the counter or sweeping the floor. 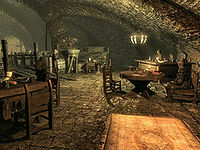 When first reaching the inn, you will find Brynjolf and Dirge, the inn's bouncer, standing talking by the counter. Dirge will soon return to his usual position on the far side of the bridge, beside the inn's sign. On the counter are a few bottles of Nord mead, an apple pie, a baked potato and a loaf of bread. On the the tables are loaves of bread, with one of them also having a horker loaf, bottle of alto wine, bread and cheese on top. Delvin Mallory who is usually found in the Ragged Flagon and is normally found sat at this table. Behind the counter is a simple, but deep fireplace, with more shelves and cupboards against the far wall. Behind one of the cupboards is a set of shelves holding more bottles of alto wine, wine, Nord mead, with a couple of common books on top. Opposite the counter is a wooden ramp leading up onto the deck. Vex is also usually found in the Ragged Flagon and is normally found standing to the right of the ramp. On the deck, there is a table on the right with a bottle of alto wine, a portion of grilled leeks, a salmon steak, a horse haunch, a sliced eidar cheese and a loaf of bread on top. If you have Dawnguard installed, behind this sitting on a bench is Galathil, the face sculptor you've probably heard of around Skyrim or Riften. On the left of the deck is a stack of crates, sacks and barrels, where you will usually find Tonilia, but she won't deal with you until you have proven yourself to the Thieves Guild by completing Taking Care of Business. At the end of the deck is one final table with an eidar cheese wheel on top. In the southeastern corner is a wooden door that leads into the Ratway Vaults, with a storage cabinet on the right that requires a key to open. This will be unlocked by Brynjolf at the end of Taking Care of Business when he will lead you to the Ragged Flagon - Cistern to introduce you to Mercer Frey and welcome you into the Thieves Guild. During the A Cornered Rat quest you will find Gissur sitting, drinking at the first table of the inn or following you around the room, unless he was killed during the Diplomatic Immunity quest. He will try and leave once you receive the information regarding Esbern, however Vekel will suddenly announce "That one, right there, walking out the door! He was one of them asking about that old man you were looking for." If confronted, Gissur will only rebuff your attempts at conversation. However, he can be attacked and killed with no repercussions, and other Thieves Guild members will join the fight on your side. During the Thieves Guild quest The Pursuit, you will find both Vex and Delvin missing and Garthar standing in front of the door leading to the Cistern with his weapon drawn. This is the merchandise found in the bar's merchant chest. These items are only available if purchased from the merchant; they cannot be pickpocketed or stolen. They are restocked every two days. The other merchants found in the Ragged Flagon each have their own merchant chests, as detailed on their individual NPC pages. As you complete the Thieves Guild reputation quests, new shopkeepers will move into the alcoves two either side of the doorway leading from the Ratway. Once you have completed all four of the special reputation jobs for Delvin, the main furniture within the inn will be improved to better quality replacements. Skyndus' shop is opened after completing the first reputation quest (see here for his standard merchandise). None of the displayed merchandise can be purchased, only stolen. It is located in the first alcove on the right when entering from the Ratway and contains a counter, three archery targets, several crates, a rack hanging from the ceiling and a chair that he seems to spend most of his time sitting in. The items on display include a random enchanted bow and loaf of bread on the counter top. On the ledge that runs around the lower part of the wall, to the northwest is a leveled bow, a medium coin purse and bunch of lavender, to the southwest, behind the targets is a long bow and to the southeast are two bottles of alto wine, two bottles of wine and a sheaf of wheat. On the ground beside his chair are a lute and drum, while hanging from the rack is a rabbit, two pheasant, a bunch of dried frost mirriam and a garlic braid. Herluin Lothaire's shop is opened after completing the second reputation quest (see here for his standard merchandise). None of the displayed merchandise can be purchased, only stolen. Arnskar Ember-Master's shop is opened after completing the third reputation quest (see here for his standard merchandise). None of the displayed merchandise can be purchased, only stolen. It is located in the second alcove on the left when entering from the Ratway, with a wrought blacksmith's sign hanging from a post above the front of the arch. It contains a forge, grindstone, workbench and a small counter. He spends his time either working at his crafting stations or sitting on the ground in front of the alcove with his legs dangling in the water. On the counter top is an iron war axe, set of bellows, tongs and hammer. There is an iron mace and greatsword, a bottle of wine and a venison chop on a wooden plate on the ledge that runs around the lower part of the walls, with two shield plaques, one of which holds a banded iron shield with two crossed iron greatswords behind. The other holds a steel shield with two crossed steel greatswords behind. Vanryth Gatharian's shop is opened after completing the fourth reputation quest (see here for his standard merchandise). None of the displayed merchandise can be purchased, only stolen. It is located in the second alcove on the right, when entering from the Ratway and contains a counter, several crates, a small unit, two food barrels and a chair that he seems to spend most of his time sitting in. The items on display include a random enchanted light armor cuirass and enchanted light armor boots on top of the counter. A helmet, a pair of gauntlets, a pair of boots and a shield, all light armor and found on the ledge that runs around, near the bottom of the walls, two hide shields on top of one of the crates and two bottles of wine on a shelf of the unit. An extra room is added to the cell by the Unofficial Skyrim Patch. This room is located directly left of the door leading to the Ratway Vaults and contains beds for the NPCs who live in the flagon. The room is not part of Bethesda's design of the cell and is not official content. Esta página foi modificada pela última vez à(s) 23h32min de 24 de dezembro de 2015.